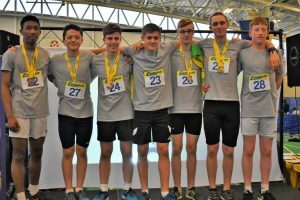 Saturday 22nd & Sunday 23rd April saw the top county teams from each of the English Regions joined by National Champions from Ulster and Wales descend on Sportcity, Manchester for the 2017 Sportshall UK Finals. In a change from recent years the Under 15’s All Rounder competition took place on Saturday with the Under 13’s Team Challenge on Sunday. The action on the track and in the field was soon under way after the opening ceremony which included some words of wisdom from the Sportshall Creator George Bunner, followed by some advice to the athletes from last year’s 2016 girls all rounder champion Amber Anning (Brighton, Coach: Stephen King) who has since gone on to represent England and finished 2016 ranked number 1 in the UK For the 300m and 4th in the Triple Jump. 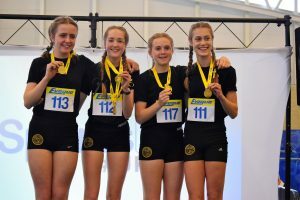 Narrowly beating Surrey the girls from Norfolk were victorious in the Team competition with 67 scoring athletes in the competition Norfolk’s girls all placed in the top half in a team victory which was clearly aided by the fantastic supporters who travelled with the Norfolk team. Serena Grace (City of Norwich, Coach: Michael Utting) won both the 4 Lap Race and the Speed Bounce with Mia Hopson, City of Norwich, Coach: Keith Yellop) scoring the highest cumulative points score for Norfolk after an equal 6th place finish in the 2 Lap Race, throwing 10.36 in the shot to place 5th and jumping 58cm to finish 12th in the Vertical Jump. The individual competition was dominated by combined events Athletes with the eventual winner being Emily Tyrrell (Devon, North Devon AC , Coach: Gill St Barbe). Emily won the Standing Long Jump (2.62m) and was joined at the top of the podium in the 2 Lap Race by Molly Palmer (Leicestershire & Rutland, Charnwood/Notts, Coach: Nigel Kesteven). Emily’s third event was the Shot in which she finished 8th with a throw of 9.55m which was good enough to hold onto the overall victory. 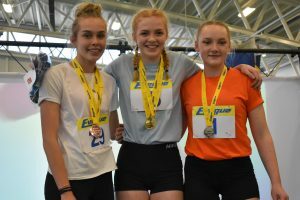 The girls’ competition was challenged throughout by Iris Oliarnyk (Birmingham, Halesowen AC, Coach: Dominic McNeillis) and Mia Chantree (Essex, Chelmsford AC, Coach: Steve Mitchell) who finished second and third respectively splitting the top three by only 11 points. 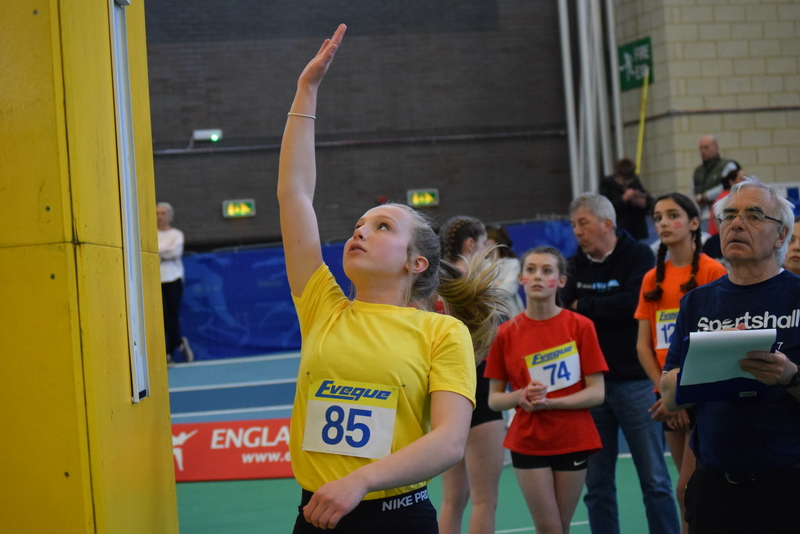 Iris was outstanding in the speed and power events finishing second in the Standing Long Jump and winning the shot with a throw of 12.67 putting an extra 13cm on her previous indoor best achieved at this year’s England Athletics U15 / U17 Indoor Combined Events Championships. Mia threw 10.60 in the shot and was just short of her best of 10.69 achieved earlier this year and picked up a well deserved bronze medal in the Shot, finished 4th in the 4 Lap race and 8th in a competitive Vertical Jump. 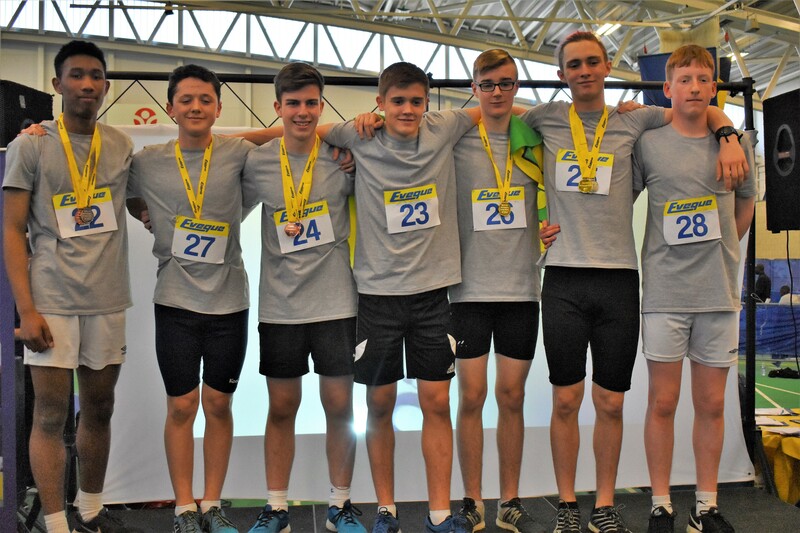 Donegal made their trip across the water worthwhile after taking the victory in the Under 15 boys Team competition for the second consecutive year ahead of Berkshire and Hertfordshire who were second and third respectively. Lughan Devenney (Donegal) was the highest scoring Ulster athlete representing the Donegal team and finished 2nd in the 4 Lap, 4th in the Speed Bounce and 10th in the shot with an overall score of 273 to finish 4th in the Individual All Rounder competition whilst supporting the team victory. Theo Adesina (Essex, Thurrock Harriers, Coach: Karl Sumun) qualified for the UK Final in his own right after a competitive East Regional event earlier in the year and was impressive throughout the day dropping only 4 points and scoring 296 of a potential 300 points. In winning the 4 Lap and placing second in the Shot and Standing Triple Jump Theo was crowned UK All Rounder Champion for 2017. 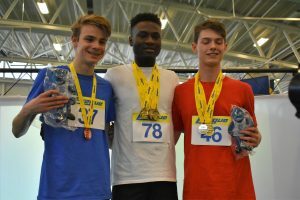 Second and third were Charlie Williams (Norfolk, West Norfolk, Coach: Christopher Ely) and Harvey Darroch (Merseyside, Wirral AC, Coach: Pamela Green / Paul Waters). Both Charlie and Harvey put in some great performances throughout the day to earn their silver & bronze medals. Sunday afternoon saw the Under 13 teams arrive at Sportcity ready for their team competition. Once again George Bunner, Creator of Sportshall took to the stage to share some of his experience with the budding young athletes from across the UK. 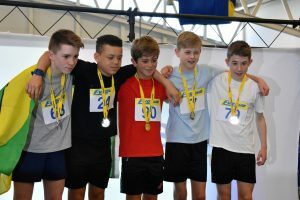 The obstacle relay is always an exciting start to any Sportshall competition and the action was kicked off on Sunday with a series of extremely competitive races. In the Under 13 boys competition the eventual winners of the team competition were Berkshire. The Berkshire boys showed their strength across the day winning 6 individual podium places and victory in both the 4 x 1 and 4 x 2 lap relays. Running 20.0 in the 2 Lap race Adam Ulhaq took the title in what was a very quick time indeed. 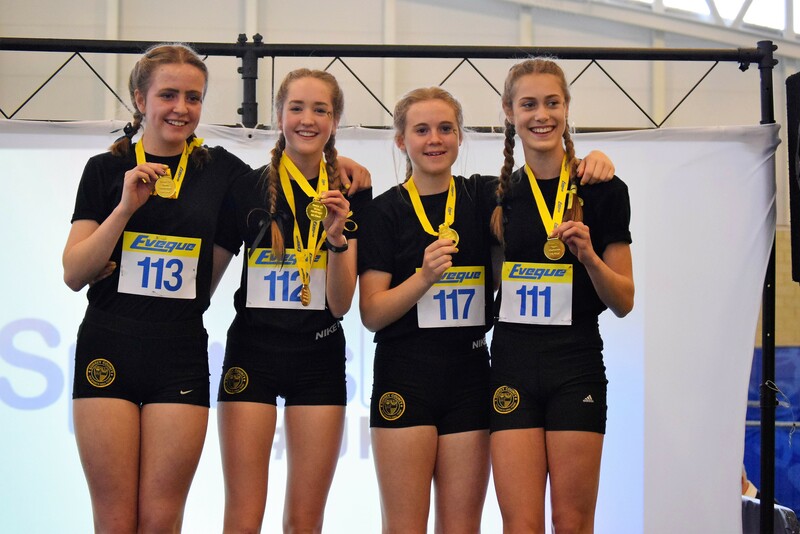 In the Under 13 Girls competition Surrey were crowned UK Champions after success throughout the afternoon with medals in all relays winning an impressive three of the four track relays and eight individual podium places including UK Champions in the Shot & Standing Long Jump. 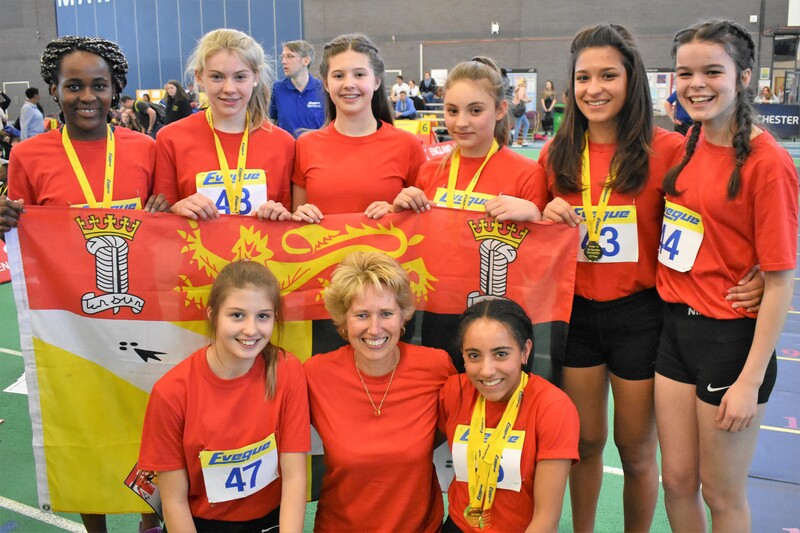 Elanor Trugg who jumped 2.40m to claim the Standing Long Jump title and Jenae James took the shot victory. Jenae threw an impressive 11.36m ahead of Adrienne Gallen (Donegal) took silver and also set a new Ulster Record of 10.87 beating the previous best of 10.75m set in 2013 by Naoimh McGranaghan. 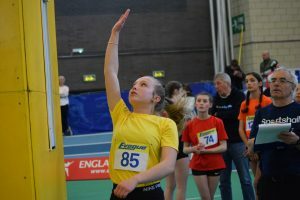 The Sportshall team would like to congratulate all those who took part in the UK Finals and extend good wishes to all the athletes for their summer Track & field season which is already under way.